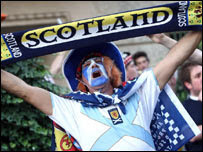 In anticipation of the Scotland v Italy Euro 2008 qualifying game tomorrow, apparently every single hotel room in Glasgow - 17,000 in total - are booked! I am looking forward to watching the game; it will be quite emotional as Scotland must win this match in order guarantee qualification for next year's finals in Austria and Switzerland. What I am not looking forward to, however, is trying to find a decent pub (with breathing room) to watch it at. Anyone got any suggestions?